As a well-known international sportswear manufacturer, Kukri Sports required a bespoke eCommerce solution to meet their enterprise-level needs. We worked closely with them to ensure they provide customers with a personalised shopping experience. Kukri Sports supplies bespoke sports kit to teams, clubs, universities, and schools worldwide. JD Sports has taken an 80% stake in the company, which commissioned us to create a series of enterprise level eCommerce websites. Kukri Sports needed a fully featured, enterprise level, eCommerce platform which integrated with its back office system and Sage 200 accounts. As it also has multiple physical store locations, the system needed to be centralised in order to keep stock level accurate. 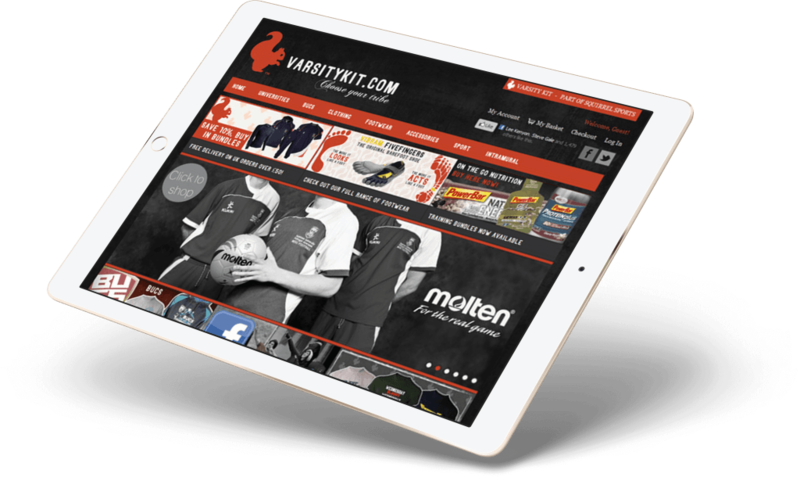 To create a cutting edge sports website design and marketing package, we used Magento and bespoke integration for synchronisation of Kukri’s stock and inventory levels to create the Squirrel Sports and Varsity Kit websites. The sites are powered by the same eCommerce platform but have different store visuals in order to more effectively match the target audiences. TAKE A LOOK AT WHAT PAUL HAS TO SAY ABOUT US.